The first day of the fifth edition of the KRMUN 2K17 was organised on 14 July, 2017 at K.R. Mangalam World School, G.K-II. Lt. Gen Sudhir Sharma, PVSM,AVSM,YSM,VSM (Retd), Chairman Mitkat Advisory Pvt Ltd graced the occasion as the Chief Guest and Ms Ruchira Gujral, Corporate Specialist, UNICEF India presided over as the Guest Speaker for the inaugural ceremony. The ceremony began with the invocation of the Almighty and the lighting of the lamp followed by the welcome speech of the Principal Ms. Alka Awasthi. The Principal, in her address to the audience emphasised on the need to have nations to willingly cooperate to a system of governance that prevents warfare and promote world peace. A spellbinding Music and fusion dance performance won applauds from one and all. The Guests, exhorted on issues of adolescent empowerment and participation in building the nation. 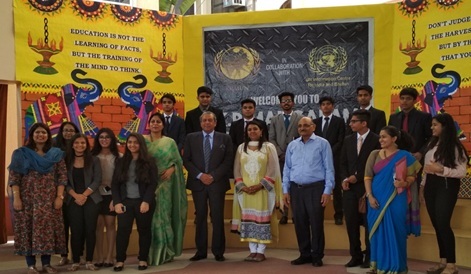 Around 350 delegates from Delhi/ NCR conglomerated to role-play delegates to the United Nations and stimulate UN committees. It is an opportunity where students learn to be diplomatic and deal with phantom international crisis, offer suggestions and find amiable solutions.